The best rivalry in baseball right now might not be the Yankees versus the Red Sox, or the Dodgers against the Giants. Instead, it might be the one between the Orioles and the Nationals, a feud that has landed in multiple courtrooms and has been literally litigated almost non-stop for over seven years. How Orioles-friendly was that deal? When MASN was created to broadcast Orioles and Nationals games in the regional territory that once solely belonged to the Orioles, the Orioles owned 90 percent of the network and the Nationals’ stake would increase by 1 percent each year until 2032, when it reached 33 percent. Late last year, news broke that Major League Baseball had reached an agreement for players to leave Cuba using a posting system similar to that which exists between MLB and the Japanese NPB or the Korean KBO. While the proposed agreement generated a great deal of excitement at the prospect of a boon of talented Cubans coming to the majors, I wrote at the time that a good deal of caution was warranted given that the United States government considered the Cuban Baseball Federation (“FCB”) to be covered by the decades-old trade embargo. There’s just one problem: the FCB is an arm of the Cuban government, and has even been run by Fidel Castro’s son, who served as its vice president. This agreement means that MLB, an American business entity, would be paying money to an unofficial arm of the Cuban government. Because of the United States’ trade embargo, which remains in effect, it’s questionable at best whether this arrangement will survive legal scrutiny. Last week, the Trump administration blocked the agreement from taking effect for exactly that reason. By far the best part of writing for FanGraphs is you, our readers. That’s not just because if you didn’t exist my words would simply be shouted into the void and I’d be talking to myself. Over the past year, you’ve sent me dozens of really thoughtful questions about the intersection of baseball and the law, and the fast pace of current baseball events (and my day job) has meant I haven’t been able to respond to half as many as I would have liked. So we’re starting this feature to provide a place where you can get your baseball law questions answered. If you have a question for the mailbag, go ahead and hit me up on Twitter @Ring_Sheryl, or email me at Sheryl@sherylringlaw.com. A couple of quick disclaimers: these are questions about general baseball concerns only; I’m not going to give you legal advice or tell you how to handle your own personal legal issues. Also, your questions might be condensed or rephrased for space purposes. We’ll do this as often as the question volume allows and necessitates. Thank you in advance for your questions! Jeremy asked: Hi Sheryl. I read your article a while back about the hypotheticals of giving Mike Trout a lifetime contract. Regarding California law, does this mean that the Dodgers (for example) couldn’t offer a contract to Bryce Harper that’s longer than eight years (if they wanted to)? Mike Trout just signed a big extension with the Angels that will guarantee the future Hall of Famer $430 million over the next twelve years. Remember, however, as Nathaniel Grow explained a couple of years agom, California, like many states, has a law which caps the length of employment contracts. A relatively obscure provision under California law — specifically, Section 2855 of the California Labor Code — limits all personal services contracts (i.e., employment contracts) in the state to a maximum length of seven years. In other words, this means that if an individual were to sign an employment contract in California lasting eight or more years, then at the conclusion of the seventh year the employee would be free to choose to either continue to honor the agreement, or else opt out and seek employment elsewhere. As we discussed before, most states (with Illinois being the most notable exception) include either a statute or common law doctrine barring lifetime contracts, though not all include a requirement that the contract be capped at a specific number of years. Does this kind of law have an impact on the offer being made by the team? Section 2855 would allow a player to opt-out of a contract after year four of a six-year contract extension, so long as he has been employed by the team for a total of seven or more years. Because of this precedent, some California companies require their employees to spend at least one day “unemployed” – i.e., not under contract with the company – every seven years in order to avoid the application of Section 2855. What does that mean? The Angels’ contract is still legally binding. Section 2855 is simply an additional term of the contract implied by law, and creates an opt-out by operation of law. In other words, when the Angels offered the twelve-year contract extension to Trout, the law simply added another term not written down: that of Trout’s right to opt out after seven years. This is important, because a number of media outlets reported the contract had no opt-outs. But that’s not entirely true – California law allows Trout to opt out after seven years. Notably, the same is true of Manny Machado’s deal; he, too, can opt out after year seven. But it is not, notably, true for Bryce Harper – Pennsylvania law allows for employment contracts of any definite term. Waldy asks: What happens if a player collides with an umpire during a play? Is it considered interference? Umpire’s interference occurs (1) when a plate umpire hinders, impedes or prevents a catcher’s throw attempting to prevent a stolen base or retire a runner on a pick-off play; or (2) when a fair ball touches an umpire on fair territory before passing a fielder. Umpire interference may also occur when an umpire interferes with a catcher returning the ball to the pitcher. Generally speaking, that means that an umpire does not commit interference by making contact with a player other than the catcher. So if an outfielder or infielder collides with an umpire while trying to make a play, and the ball drops, the play continues even if the umpire was at fault. DJ Asks: Are there any independent audits of salary arbitrations in MLB to make sure the arbitrators follow the rules? In a word, no. Now, under the Collective Bargaining Agreement, the MLB Players’ Association has the right to audit “any particular transaction” of a team. If we give the broadest possible meaning to the term “transaction,” we could argue that this language includes arbitrations, which in theory would give the MLBPA audit rights of arbitration proceedings. Now, this is a pretty stretched interpretation; under the CBA, a “transaction” is an instance in which a player signs a contract with a team, or two teams make a trade, or a team is sold. So an arbitration isn’t so much a “transaction” as it is a device meant for conflict resolution. And as far as I can tell, even if the MLBPA believes it has audit powers over arbitrations, it has not – at least publicly – exercised those audit rights. And the CBA is explicit that arbitration awards are confidential. There shall be no release of the arbitration award by the arbitration panel except to the Club, the Player, the Association and the LRD. The panel chair shall initially inform the Association and the LRD of the award only and not how the panel members voted. The panel chair shall disclose to the Association and the LRD the individual votes of the panel members on each March 15 following the February hearings. Although we know that teams have individual audits conducted on their own financial data, it doesn’t appear that those audits include arbitration results. And because the arbitrators don’t issue written findings, the result is that we don’t really know how or why an arbitrator makes a particular decision. That’s a feature of the system, not a bug, designed to protect the sanctity of the process. Whether or not it’s a good idea I leave for you to decide. Can Umpires Really Do Anything They Want? There’s a saying in my profession that “the law is what the court says it is.” That’s a paraphrase of a famous line from Justice John Marshall in Marbury v. Madison that “[i]t is emphatically the province and duty of the judicial department to say what the law is.” The point is that the law is open to interpretation, even if the words on the page are unchanging. Your interpretation, my interpretation, even Meg Rowley’s interpretation – none of that matters. The only interpretation that matters at the end of the day is that of the person wearing the robe. In the next half-inning, [umpire Ron] Kulpa called a borderline first pitch strike against Tyler White. The entire Astros dugout charged toward the railing and erupted with vitriol toward Kulpa. Kulpa removed his mask and yelled back. [Astros Manager A.J.] Hinch came out to diffuse the situation and, at that point, no one was ejected. [Houston coach Alex] Cintron did not cease his criticism. Kulpa tossed him as Hinch returned to the dugout. A pitch later, while Kulpa still stared into the Astros’ dugout, Hinch began to bark back. Kulpa ejected him. But there’s more to this story. Evidently, Kulpa subscribes to the Marbury v. Madison school of umpiring power. Notably, Hinch wasn’t arguing balls and strikes when Kulpa ejected him. And just to prove the point that he really, truly, could do anything he wanted, Kulpa proceeded to make himself the center of the spectacle, including initiating physical contact with catcher Max Stassi. There’s a lot to unpack here, most notably, Kulpa’s assertion that, as an umpire, he can do anything he wants. But before we get there, we have to explain something. By far the most common question I get from clients in my day job is “can s/he do that?” And my answer is always the same. The law isn’t a magic force that uses midichlorians to prevent a person from killing or stealing. A person can – in the sense of physical capability – do whatever they want. The only laws that can stop them are the laws of biology and physics. What the law can do is punish people for doing those things. In essence, the law is a gigantic set of incentives and disincentives. The same applies to the rules of baseball and Ron Kulpa. Gandalf won’t appear to stop Kulpa from transgressing some rule on umpire conduct. So what we’re looking at here is not whether Kulpa is right in the literal sense, but rather whether there are limits in place that, were Kulpa to transgress them, provide for some kind of consequence. But while the terms of the Major League Constitution grant the commissioner that kind of unlimited authority, there’s no such similar grant for umpires. Umpire duties are covered by Rule 4.01 of the Official Major League Rules, which includes things like ensuring alternate regulation baseballs are available, inspecting baseballs, and ensuring compliance with equipment specifications. In fact, to the extent the umpire’s power is delineated by a list of duties, essentially the entire baseball rulebook is a list of what the umpire can and should do. Nearly every rule tells the umpire what to do, because it’s the umpires who enforce the rules. If case law and statutes are an instruction manual for judges, then the Major League Baseball rulebook is an instruction manual for umpires. But this is a non-exhaustive list, and it doesn’t say what an umpire can’t do. For that, we need Article 8.00, conveniently entitled “The Umpire.” In Rule 8.01, we learn what the umpire’s authority is. 8.01 Umpire Qualifications and Authority (a) The League President shall appoint one or more umpires to officiate at each league championship game. The umpires shall be responsible for the conduct of the game in accordance with these official rules and for maintaining discipline and order on the playing field during the game. (e) Each umpire has authority at his discretion to eject from the playing field (1) any person whose duties permit his presence on the field, such as ground crew members, ushers, photographers, newsmen, broadcasting crew members, etc., and (2) any spectator or other person not authorized to be on the playing field. Based on this, Ron Kulpa is partly right. As the personification of Major League Baseball on the field, the umpire does indeed have vast authority for “maintaining discipline and order.” And note that the umpire has authority to eject a person merely for objecting to a decision, and not only for unsportsmanlike conduct. The umpire can even eject a player in the middle of a play! This is, frankly, a poorly written rule; as written, the umpire can theoretically eject a manager who asks for a replay review; by asking for that review, the manager is, by definition, objecting to a ruling. And, most notably, Rule 8.01(c) basically says that where the Rules don’t cover something, the umpire has discretion to make up a rule. This is obviously really broad authority, and, for the most part, the rest of Article 8.00 doesn’t get any less so. Rule 8.02, which governs appeals of umpire decisions, allows those appeals only to the umpire who made the decision in the first place. Under Rule 8.03, the umpire-in-chief (as in, the home plate umpire; this is not the same as the crew chief) has even more authority; he can “[a]nnounce any special ground rules, at his discretion.” (In this context, a “ground rule” is one that the umpire “thinks are made necessary by ground conditions, which shall not conflict with the official playing rules.”) In other words, if Ron Kulpa wanted to announce a Rule that any ball that hit the roof of Tropicana Field was a home run, he could do that. The umpires do have a lot of power. If this were all there was in Article 8.00, Kulpa would probably be right. But there’s one more part of Article 8.00, entitled “General Instructions to Umpires.” They are, essentially, the rules that umpires are supposed to follow. Here are some excerpts. Be courteous, always, to club officials; avoid visiting in club offices and thoughtless familiarity with officers or employees of contesting clubs. When you enter a ball park your sole duty is to umpire a ball game as the representative of baseball. Do not allow criticism to keep you from studying out bad situations that may lead to protested games. Carry your rule book. It is better to consult the rules and hold up the game ten minutes to decide a knotty problem than to have a game thrown out on protest and replayed. Keep the game moving. A ball game is often helped by energetic and earnest work of the umpires. You are the only official representative of baseball on the ball field. It is often a trying position which requires the exercise of much patience and good judgment, but do not forget that the first essential in working out of a bad situation is to keep your own temper and self-control. Most important rule for umpires is always “BE IN POSITION TO SEE EVERY PLAY.” Even though your decision may be 100% right, players still question it if they feel you were not in a spot to see the play clearly and definitely. Based on these instructions, there are things that Ron Kulpa can’t do. For one thing, he can’t be discourteous; he must be courteous “always.” He is supposed to keep a game moving. He is supposed to maintain his temper and self-control. And he is supposed to elevate being right above his own dignity. And believe it or not, Major League Baseball really does enforce these rules. That is, the commissioner – who, remember, really does have plenary power – enforces these rules. Some umpires have been suspended or fined for misapplying rules or allowing teams to engage in rule violations. In fact, umpires get disciplined all the time. Now, it’s true that the commissioner’s office has considerable latitude when it comes to disciplining umpires. In fact, the men with the chest protectors are chastened “frequently,” according to one source. Some umpires are forced to sit because of poor performance. Just like a slumping slugger. The difference is that, under the collective bargaining agreement between the umpires’ union and Major League Baseball, and unlike the players’ CBA, most discipline and disputes between the league and union are confidential. That’s why it was a big ruckus when umpires staged a brief protest, wearing white armbands to signify opposition to comments made by Ian Kinsler regarding Angel Hernandez. MLB immediately stated that the protest violated the umpires’ Collective Bargaining Agreement. So Ron Kulpa can do whatever he wants; that’s true. And players and managers can’t do anything about it. But Major League Baseball can, and, often, does. Being an umpire is a difficult job. But omnipotence, it seems, doesn’t actually come with the territory. As a part of the FanGraphs staff predictions for this season, I picked the Boston Red Sox to win the American League East, and the New York Yankees to pick up a wild card slot. All 32 of us picked the Yankees to make what would be a third consecutive trip to the postseason. And our preseason projections pegged the Bronx Bombers for 99 wins, the best record in baseball, and a whopping 66.4% chance of winning the American League East. The Yankees – on paper, at least – were and are good. But life, they say, is what happens when you’re busy making other plans. The Yankees have started slowly, yes, but a 2-4 record is hardly alarming when you’re less than a week’s worth of games into a 162-game season. More worrisome is the fact that the Yankees’ injured list is suddenly beginning to resemble an All-Star team in its own right. First, newly extended center fielder Aaron Hicks went from tweaking his back in Spring Training to receiving two cortisone shots to an indefinite injured list stint with a lower back strain. That’s not good, seeing as Hicks is the second most valuable center fielder in the American League since 2017, behind some guy named Mike Trout. Still, the Yankees are deep, and they could plug Brett Gardner into center field without suffering a major catastrophe. If this had been the team’s only major injury, the team might have been fine, especially on the back of what was projected to be an elite starting rotation. But also-newly-extended ace right hander Luis Severino joined Hicks on the shelf late in Spring Training after suffering rotator cuff inflammation, and isn’t expected back until May. Shoulder problems, including rotator cuff injuries, are notoriously finicky in pitchers, and while there’s no reason to believe Severino’s injury is more serious that we know, we also don’t know how the hard-throwing right-hander will fare after returning from the injury, particularly after not having had a single Spring Training start. With C.C. Sabathia’s farewell tour on hold after offseason heart surgery, the Yankees’ rotation suddenly started to look a little thin. But no matter. The Yankees still had a fearsome lineup and perhaps the best bullpen ever, right? But then Dellin Betances’ spring training fastball clocked in the high-80s, and it wasn’t long before a shoulder impingement was diagnosed as the cause of his missing velocity. So Betances joined the list of the Yankees’ walking wounded. Of course, why should the pitching staff have all of the fun? On the same day, two lynchpins of the Yankees’ fearsome lineup – outfield adonis Giancarlo Stanton and sophomore third-sacker Miguel Andujar – both suffered significant, and potentially long-term, injuries. Stanton suffered a left biceps strain whilst swinging and missing in just the team’s third game of the season, and Andujar suffered a small tear of his labrum diving into third base in the same game. By the end of the team’s second series of the year against the Tigers, Troy Tulowitzki had joined the injured list as well with a calf strain. That’s 18.6 projected fWAR on the injured list at one time, which is more than the 2019 projected WAR for the entire Orioles team. That might also be understating the value of these players; they posted a combined 26 WAR in 2018. Some of these injured list placements were expected; after all, both Gregorius and Montgomery are still recovering from Tommy John surgery and aren’t expected back until midseason, and outfielder Ellsbury fell into a temporal vortex and likely will never be heard from again. Still, that’s a contending team’s starting third baseman (Andujar), starting shortstop (Gregorius), the replacement for the injured starting shortstop (Tulowitzki), starting left fielder/designated hitter (Stanton), and starting center fielder (Hicks), along with its No. 1 (Severino) and No. 4 (Sabathia) starters, and primary setup reliever (Betances), all injured at once. That’s a lot of WAR for any team to lose, even the Yankees, even temporarily; the team is missing the equivalent of one and a half Mike Trouts. So in some ways, it’s a minor miracle that even after losing that much talent, the team is still projected to win 95 games. In fact, owing to the Red Sox’s nightmarish West Coast trip, the Yankees’ odds of winning the division have remained relatively steady since Opening Day, though they have dipped slightly. The good news is that the Yankees’ pitching staff is well equipped to weather the storm. Johnny Loaisiga and Domingo German have both impressed as replacements for Sabathia and Severino. Even without Betances, a bullpen featuring Adam Ottavino, Zack Britton, and Aroldis Chapman is still fearsome, even if Chad Green has been hittable in the early going. James Paxton and Masahiro Tanaka have been great. Sabathia is expected back before the end of April, with Betances back around the same time. Severino’s return is somewhat murkier, but projected around May or June. In short, the Yankees should still spend the bulk of their season with their pitching at least largely intact. The larger problem is one you wouldn’t have anticipated going into the season: the offense. And unlike the pitching staff, help isn’t arriving any time soon. Stanton hopes to be back in early May barring a setback, but Andujar is without a timetable and still may require season-ending surgery. All of a sudden, an infield without a place for D.J. LeMahieu to play regularly just a week ago is deploying Tyler Wade as its starting second baseman. Didi Gregorius won’t be back until the second half. With so many big bats missing, the result is about what you’d expect. The Yankees gave up just six runs in their most recent three-game set against the Detroit Tigers, but scored only five and dropped two out of three. Tuesday, a lineup featuring D.J. LeMahieu batting fifth managed just one run against Jordan Zimmermann; Wednesday, the team struck out 18 times against a Tigers pitching staff that ranked just 24th in pitcher WAR, 25th in FIP, and 26th in strikeout rate in 2018. The second wild card gives the Yankees a considerable margin for error, as does their depth. It might all prove to be fine. That said, with Tampa Bay, a deep and talented team in its own right, off to a 5-1 start, and the Red Sox healthy, the Yankees might not have the luxury of treading water until their injured players return if their goal is to win the division. Aaron Judge and Gary Sanchez can’t carry the offensive load by themselves, and Greg Bird is himself injury-prone. Clint Frazier is talented, but untested and coming off a concussion that ruined his 2018. Unless the team is willing to use heavy doses of Mike Tauchmann and Tyler Wade moving forward, the Yankees may have no choice but to start looking for offensive help from outside the organization. Back in 2014, Devin Mesoraco broke out for the Reds, blasting 25 homers en route to a 147 wRC+ and 4.1 WAR. Injuries have struck since then, however, and he’s posted four consecutive sub-replacement level seasons. That said, last year, things did improve after he was dealt midseason to the Mets for the erstwhile Dark Knight of Gotham, at least by some measures. Baseball Reference has Mesoraco at 0.7 bWAR after the deal across 66 games and 229 plate appearances, with improved defense and power numbers, while Baseball Prospectus had Mesoraco at 0.4 BWARP; our WAR has him very slightly negative during his time in Queens (-0.1 WAR). 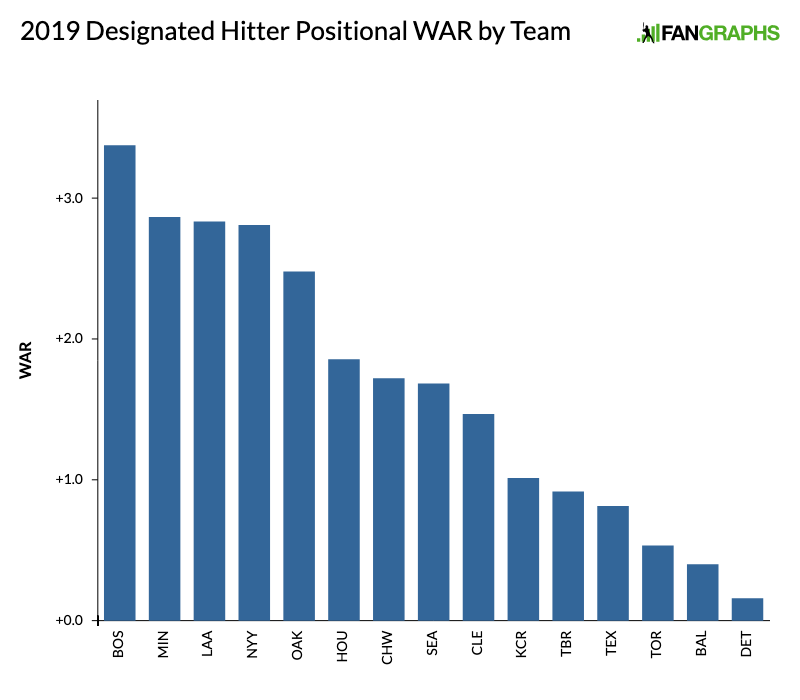 If you read FanGraphs’ 2019 positional power rankings (and you should! ), then you know that Mesoraco’s Mets production over the course of a full season would make him one of the better catchers around, though that’s as much an indictment of the position as it is a reflection of Mesoraco’s talent (ZiPS and Steamer, for their part, both project Mesoraco as about replacement level in 2019). We’ve written multiple times in these digital pages about the longstanding battle over minor league wages. More recently, it looked like the battle might be on the verge of ending with the passage by Congress of the Save America’s Pastime Act, a statute that had the dual effect of capping minor league players’ pay and threatening the existence of Independent Leagues. Then MLB moved on to state-level lobbying, working in Arizona to cap minor league wages there. In short, MLB seemed to be winning the right to pay minor leaguers far below minimum wage on a broad scale. The issue of minor league pay is one that baseball writers have been raising in earnest for almost twenty years. Local newspapers detailed how the low wages impact minor leaguers in their towns. Dirk Hayhurst wrote multiple books about it. Russell Carleton has covered the issue extensively, including discussing how low minor league wages can impact minor leaguers’ health and nutrition for their entire lives. When the body is malnourished (or tired), the brain begins playing a game of triage with cognitive functions. The first ones to go are the higher neurological functions, like attention, pattern recognition, and planning/decision-making centers, followed by fine motor control… things that might be helpful in playing baseball. Chris Mitchell talked about low wages disincentivizing baseball careers. ESPN and baseball blogs have weighed in. National news publications called minor league pay “poverty-level wages.” In the legal community, lawyers have been discussing the issue even longer, with one 1996 law review article calling for unionization of minor leaguers and drily noting that “life in the minor leagues leaves much to be desired.” And major leaguers have begun calling for increased wages too. 8 cont’d) less than minimum wage. We did the math on our checks one year and it was like less than $2 an hour or something. PS.. rent isn’t paid for, car not paid for, gas? Nope. Clubhouse dues, nada. Benefits… laughable. Minor league motto, “don’t like it, play better). Most recently, Emily Waldon wrote a piece for The Athletic that explained that even discussing the low compensation in the minors is enough to end minor leaguers’ careers. “You talk about this, you’re canned,” an AL West High-A player told The Athletic. “Nobody wants to have you in your organization anymore. You can’t talk about it. Years of work and diligent reporting from across baseball seem to have finally had some impact. Last week, the Toronto Blue Jays announced that they were voluntarily introducing a 50% increase in their average compensation for minor league players. The Jays’ decision was lauded by many, and prompted praise from the MLB Players’ Association. Union head Tony Clark lauded the Toronto Blue Jays on Monday for giving minor league players a 50 percent raise, and he hopes other clubs do the same. Representatives from the players’ association visited the Blue Jays’ spring training camp a day after The Athletic reported the team planned to boost pay for all minor leaguers, with some making as little as $1,100 a month in recent seasons. The Cubs, too, are already discussing following suit. At first, Major League Baseball was evidently “not thrilled with the Blue Jays’ decision,” and Maury Brown wrote that “the Commissioner’s Office has no plans to seek the pay increase across all 30 clubs.” But within days, the league had changed its tune, at least publicly, and revealed that it had raised the idea of minor league wage increases with the National Association of Professional Baseball Leagues, which operates and manages the minor leagues. The decision represents the culmination of what ESPN’s Jeff Passan called “years of weathering criticism and lawsuits regarding minor league pay[. ]” Major League Baseball, it seems, is no longer willing to consider the storm of negative press arising out of the poverty wages minor leaguers receive as part of the cost of doing business. And some industry observers have speculated that Kyler Murray chose football over baseball, at least in part, due to minor league pay and working conditions. Ordinarily, paying minor leaguers more would be an unqualified good thing. That said, there are a couple of catches here. For one thing, the Jays’ decision itself didn’t really make that big of a practical difference for the players who stand to benefit. Fifty percent sounds like a big number, but the increase doesn’t even make Toronto’s farmhands the highest-paid in the minor leagues and the new average salary will still be under $12,000 annually. (It will be interesting to see if their decision prompts other clubs to raise their salaries, and thus, raises the average salary across the board, though given teams’ past resistance to increasing minor league compensation, we would be forgiven for being skeptical that such a trend will emerge.) Second, MLB’s proposal to pay minor leaguers more requires those salaries to be paid, at least in part, by the minor league teams themselves, instead of (as is the current setup) by their far wealthier major league parent teams. The complexity of such fundamental changes to the system could complicate bargaining, particularly with regard to the cost and how much each side is responsible for. MLB’s position on progressive policy for minor leaguers has strong support among major league owners, an owner familiar with the discussions told ESPN, but the expectation is that minor league affiliates would pick up at least some of the burden of the various improvements. Minor league teams, which lack the resources of a major league team, may well be unable or unwilling to shoulder those additional costs. And MLB likely knows this, which means that their proposal may be nothing more than an attempt to seek good public relations and shift the blame for low salaries elsewhere. After all, major league teams could afford to address the issue now, and on their own, if they were motivated to do so. At the same time, the mere discussion of increasing minor league salaries is a significant step forward that cannot be understated. And MLB isn’t saying that minor league affiliates must pay all of the salary increases, which means that the league may well be open to funding pay raises on some level. This isn’t going to solve the minor league salary problem and lift minor leaguers out of poverty. But the league and some teams participating in the discussion about why these raises are needed is, in and of itself, a substantial shift in the public conversation about the issue. By now, you already know – thanks to Dan Szymborski’s breakdown – that Major League Baseball and the MLB Players’ Association agreed to rule changes for the 2019 and 2020 seasons. Dan provided an analysis of the on-field repercussions of these new rules, but there are other consequences as well – for the first time, it appears the MLBPA might be making inroads in its cold war with the league. Perhaps the most important part of the deal isn’t the elimination of August trades, the tweaking of All-Star Game starter selections, the incentives for stars to participate in the derby, the elimination of one-out relievers or the addition of a 26th player next year. It’s the provision that the sides will begin discussing labor issues imminently, far earlier than they typically would with a CBA that doesn’t expire until December 2021. Those discussions, sources told ESPN, will center on the game’s most fundamental economic tenets — not only free agency but other macro issues with deep consequences. The bargaining over distribution of revenue could be the most difficult gap to bridge, with teams clearly paring back spending on aging players while players chafe at the notion that those 30 and older are no longer worthy of the deals they received in the past. While a compromise could be reached in distributing more money to the younger players whom the current system underpays, the complications of doing so warrant a long runway for discussions. Now, if you’re a cynic, you might think that merely getting the league to the table doesn’t constitute much of an accomplishment, as the league doesn’t actually have to agree to anything. After all, the Collective Bargaining Agreement gives MLB the right to unilaterally change virtually any on-field rule it wants to without the permission or agreement of the union. Further, guaranteeing a 26th roster spot all season is a big win for the union, as it essentially creates at least thirty more full-time jobs. These are jobs the league didn’t have to agree to create – remember, Rob Manfred could have just imposed the remaining rules himself, without the union’s agreement – but it did so, without a corresponding concession. The winner of the All-Star game gets a guaranteed million dollars, which is a lot of money considering that this award is nearly twice the major league minimum, and more than the salary of most of 2018’s participants. So why make these concessions? It’s obviously early, and I’m not privy to the actual dialogue within the league office. But it at least appears that the league is finally considering a work stoppage, and the legal battles that would come along with it, as both a possible and unacceptable outcome. Part of that undoubtedly has to do with the union’s new chief negotiator, Bruce Meyer. Meyer is in no small part responsible for the percentage of revenue guarantees for players in the NFL, NHL, and NBA collective bargaining agreements. Major League Baseball is the only one of the four major North American mens’ sports leagues without such a guarantee, and the league is probably concerned that Meyer would make such a guarantee a sticking point in 2021 talks. Extending an olive branch now allows for the league to take a harder line on this issue later, particularly from a public relations perspective, particularly given Meyer’s history with MLB’s attorneys. Major League Baseball is chiefly represented by (among other attorneys and law firms) a firm called Proskauer Rose. There are a handful of law firms that strike fear in the sports world. None, though, is quite like Proskauer Rose. The New York-based firm has represented all of the major sports leagues — NBA, WNBA, NFL, NHL, Major League Baseball and Major League Soccer — produced two commissioners (David Stern and Gary Bettman) and trained a legion of attorneys to outmaneuver players’ advocates. Many Proskauer attorneys eventually work for leagues, teams or key companies in sports. To the extent professional sports connects to one law firm, it’s Proskauer. Proskauer represented the Marlins when Jeffrey Loria sold the team to the group led by Bruce Sherman and Derek Jeter. They’ve represented the league when it’s been sued, including in the minor league minimum wage cases. When the league gets in trouble, it hires Proskauer. And Bruce Meyer has had success against Proskauer before. In 2016, for example, when Meyer worked for the National Hockey League, player Dennis Wideman was suspended 20 games by commissioner Gary Bettman. Wideman appealed and the suspension was cut in half by a neutral arbitrator, pursuant to a collective bargaining agreement Meyer helped to negotiate. (The arbitrator in question, James Oldham, also handles baseball arbitrations.) Proskauer, on behalf of the NHL, fired the arbitrator and sued the union, arguing that Bettman’s initial suspension should stand. Meyer, representing the union, won handily. Now, Meyer, as good as he is, isn’t a panacea for labor unions, as he himself admits. He’s lost to Proskauer more than once, and he is the first to concede that protracted legal battles between leagues and unions have a lot of collateral damage for players. But part of that is also due to the structural mismatch inherent in labor disputes: the league will always have more money and more resources, while the players have to miss paychecks and potentially decide whether to dissolve their union in order to seek recourse in court. As a result, Meyer’s talents notwithstanding, the league will always have a significant advantage in labor disputes. In the event of a lockout or work stoppage, ownership is far better equipped to deal with a long-lasting impasse than the players are – particularly young, pre-arb players, who would face legitimate financial pressure should their $550,000 annual salaries disappear for more than a few weeks. Recent call-ups from the minors would be in even worse shape. So this agreement shouldn’t be taken as a sign that MLB is quaking in its proverbial boots at the thought of a confrontation with Meyer and the MLBPA. This could be a bit of strategy on MLB’s part, offering small concessions now while preparing for larger fights ahead. It may be a sign of nothing more than the league taking the union more seriously as an adversary. After all, not everything went the MLBPA’s way. The three-batter rule certainly isn’t good for players, the union notably didn’t agree to it, and Manfred imposed it unilaterally. But that’s still progress. In a very real sense, that MLB was willing to come to the table at all could demonstrates a real breakthrough in the cold war between the league and union, even if merely agreeing to negotiate isn’t a guarantee that the labor disputes of the past couple of years are behind us. For fans dreading the very real prospect of a work stoppage, it’s hard to not be at least cautiously optimistic in the wake of these developments. Perhaps no position has been more impacted by the phenomenon of tanking than designated hitter. Teams that fancy themselves contenders splurge on elite bats like J.D. Martinez and Giancarlo Stanton, while teams out of contention rotate light-hitting utility infielders through without regard for the offensive demands of the position. The result is yet another year with a clear divide between the haves and the have-nots – a line that doesn’t really correlate well with how much is spent. Yes, the Red Sox, Yankees, and Twins brought in their primary DHs on lucrative contracts, but guys like Khris Davis and Shohei Ohtani cost far less. The Astros embraced the idea of using a homegrown positionless bat, employing Tyler White at a relative pittance. At the other end of the spectrum are teams like the Blue Jays and Orioles, who spent big a few years ago on positionless sluggers and now find themselves with sunk costs.